After painful failures to carry the baton round at the last World Championships and the Olympics a year before them, the United States put it all together tonight as the world finally saw a sprint relay meeting all the way to the line between themselves and the defending champions, Jamaica. Carmelita Jeter was losing ground to the woman she beat in the individual 100m final, Veronica-Campbell Brown, but Jamaica’s 200m champion – also rested in the earlier heats - had been given just a little too much to do as Sherone Simpson had handed the baton to her three metres down on the Americans. The distance was closer to a metre at the end, but Jeter – despite showing the strain of her effort at the end of a long, hard week - had her second gold of the Championships as she crossed in 41.56, replacing the US winning time of 41.94 in the heats at the head of this year’s world lists. Campbell-Brown, unrelenting in her victory over Jeter in the longer sprint here, looked, frankly, disappointed. 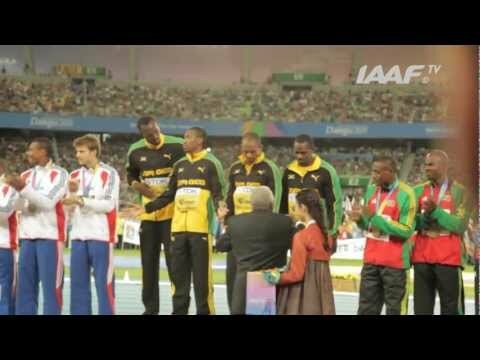 Jamaica took silver in a national record of 41.70, with a delighted Ukraine team - who did not include any individual finalists - taking bronze in a season’s best of 42.51 ahead of Trinidad and Tobago, who clocked 42.58. Russia, the Olympic champions, had to settle for sixth place in a time of 42.93. As well as drafting in Jeter for the final, the US were able to supplement their team with the 200m bronze medallist Allyson Felix, who maintained the lead she had been handed by first leg runner Bianca Knight before handing on to Marshavet Myers, who extended it against her third leg opponent, Simpson. It was the first meeting between these nations in a women’s relay final since the 2007 World Championships, when the United States narrowly retained their habitual supremacy by finishing just 0.03 ahead. But both teams contrived to get themselves disqualified in the 2008 Olympic heats as they failed to negotiate baton changes, leaving a grateful Russian team to pick up the Olympic title in the final. Hopes rose again before the Berlin World Championships, but there was further anti-climax as the US team failed to complete their qualifying heat, leaving the way clear for a Jamaica quartet including the Olympic gold medallist Shelly-Ann Fraser and Kerron Stewart, who jointly won the 100m silver, to claim their first women’s sprint relay win at the Championships since 1991.